This was the first year and type of the Morgan Dollar, and it's highly desirable. The optimal grade for high end collecting is MS65. The stronger or bolder the tails feathers the more vauable. 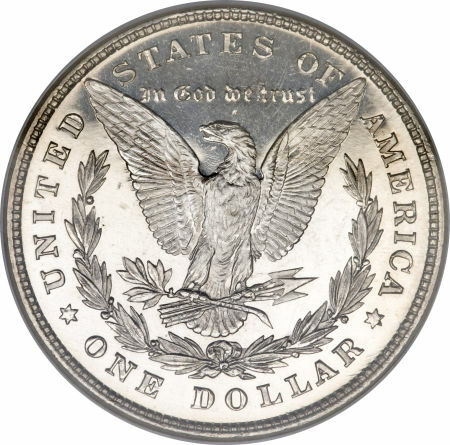 Mint mark: If none can be found it is (Philadelphia Mint), but many have the mint marks D (Denver Mint - 1921 only), S (San fransisco Mint), O (New Orleans Mint). 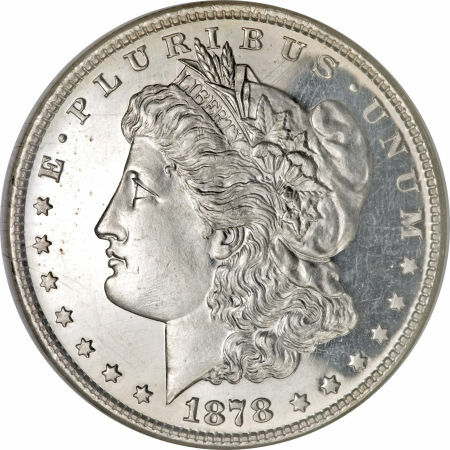 Note: This George T. Morgan creation has become America's most collected, famous, and abundant silver dollar. Coupled with the coin's size, silver content, beautiful design and high mintages it's no wonder it's coin collectors most favorite coin. 1878 with reverse of 1878 (concave). 1878 with reverse of 1879 (convex). 1878 7/8 Tail Feathers There two main types strong 8TF and weak 8TF (Referred to as 7/3 TF). Also, there's 8TF, 7TF and 1878 with 1879 Rev. reverses used. Are you getting ripped off buying Morgan Dollars? Are you buying over graded or cleaned Morgan Dollars?